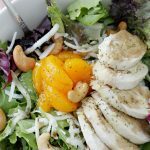 This recipe for Cashew Chicken Salad is a copycat of one from a small restaurant in my hometown. 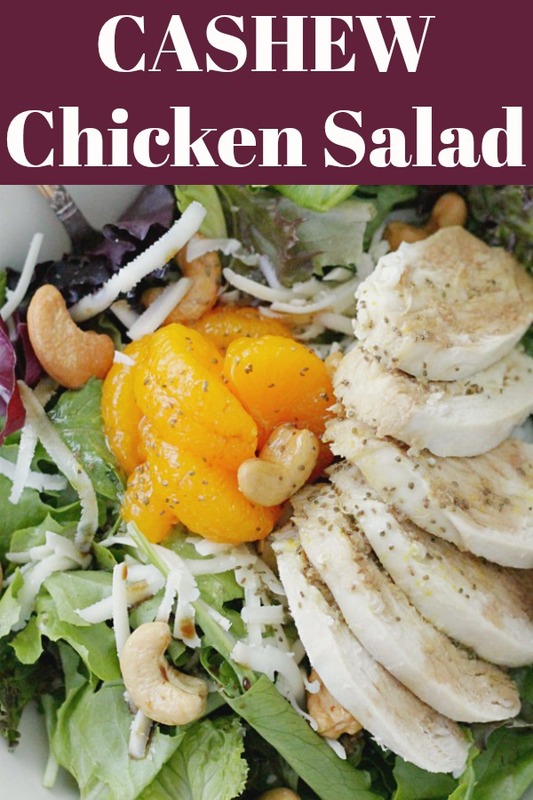 Juicy poached chicken, crunchy cashews and sweet mandarin orange slices combine with a brown sugar, soy and sesame drizzle plus a homemade celery seed dressing for a fresh and fun salad that is so delicious. I took my daughter to see Taylor Swift’s Reputation tour this past weekend. What a fun party that was! It will be a hard concert to top. Afterward we zipped over to my hometown for a couple of days to visit my family and while there ate lunch at a favorite restaurant. I love the fact that the menu hasn’t changed and I ordered my very favorite thing – Cashew Chicken Salad. This salad has elements of Asian flavors but it’s still very approachable. They actually serve theirs with iceberg lettuce. I thought about it but decided to bump up the nutrition just a bit with spring mix lettuce. 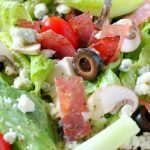 If you have poached chicken ready to go in your refrigerator this salad comes together in just a few minutes. If you are even shorter on time you could top it with your favorite bottled vinaigrette dressing. Newman’s Own makes a yummy sesame ginger one. But to try and stay true to the original salad recipe described on the menu I’m giving you the recipe for both the soy sauce drizzle and the celery seed vinaigrette. The celery seed vinaigrette is a great accompaniment to pretty much any salad. 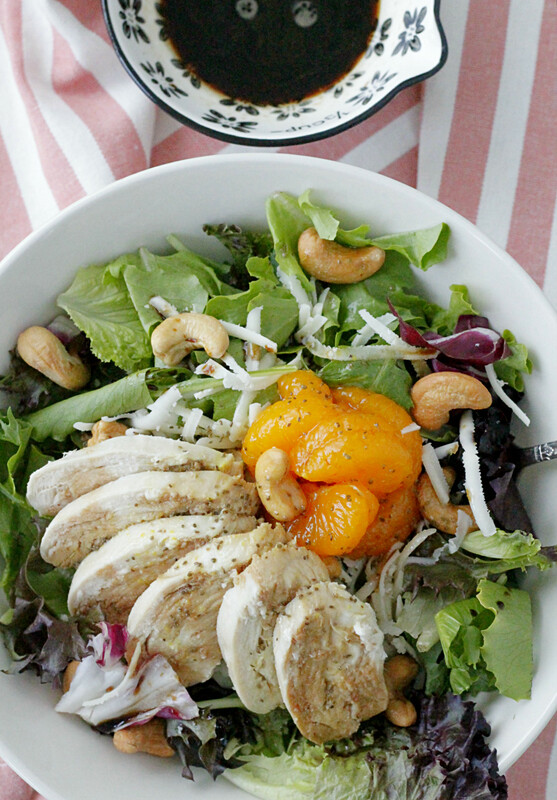 Keep poached chicken on-hand in the refrigerator to make quick work of topping salads like this one. Find the recipe tutorial for how to poach chicken breasts here. 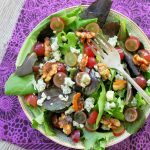 I like using lightly salted or even unsalted cashews for this salad. 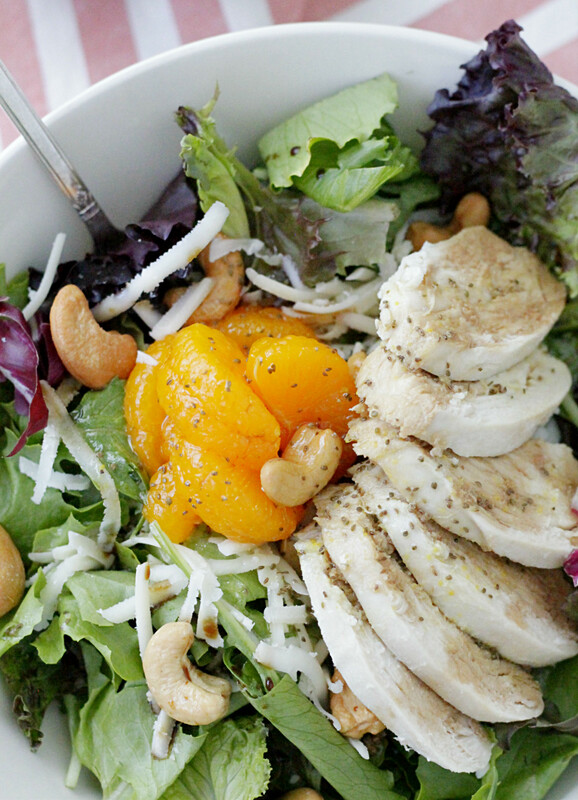 To keep your calories in check be sure to measure the amount of cashews you use to top each salad. The dressing can be made ahead and stored in a shaker in the refrigerator for up to one week. Buy a big bunch of salad greens from your local farmer’s market and store them in an air-tight container with paper towels to keep them fresh – as described here. 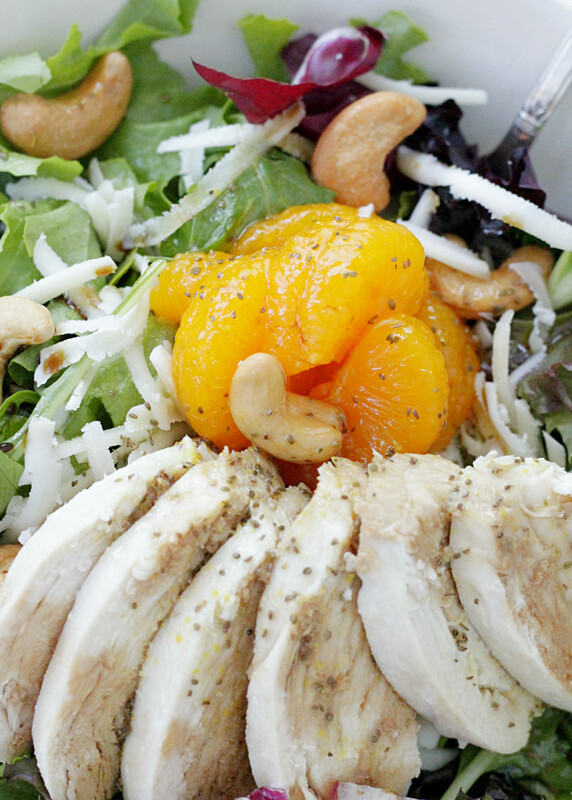 Juicy poached chicken, crunchy cashews and sweet mandarin orange slices combine with a brown sugar, soy and sesame drizzle plus a homemade celery seed dressing for a fresh and fun salad that is so delicious. 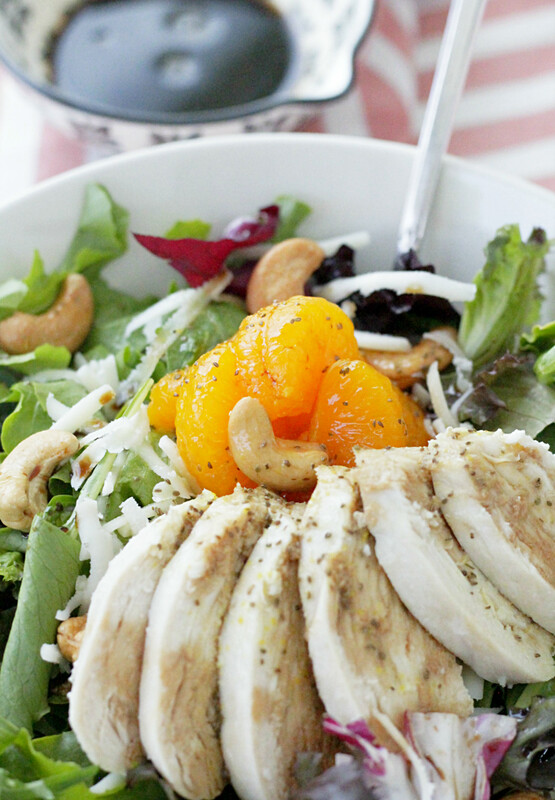 Divide the salad ingredients evenly among four bowls - salad greens topped with poached chicken, cashews, shredded cheese and mandarin oranges. Whisk together the soy sauce, brown sugar and sesame oil and very lightly drizzle it over the chicken in each of the four bowls. 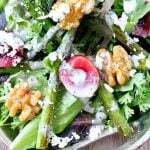 Whisk together the dressing ingredients - sugar, olive oil, cider vinegar, celery seed, mustard and salt. Top the salads evenly with the dressing and serve.